People of color are incarcerated in huge numbers. And they’re manufacturing America’s symbol of freedom. 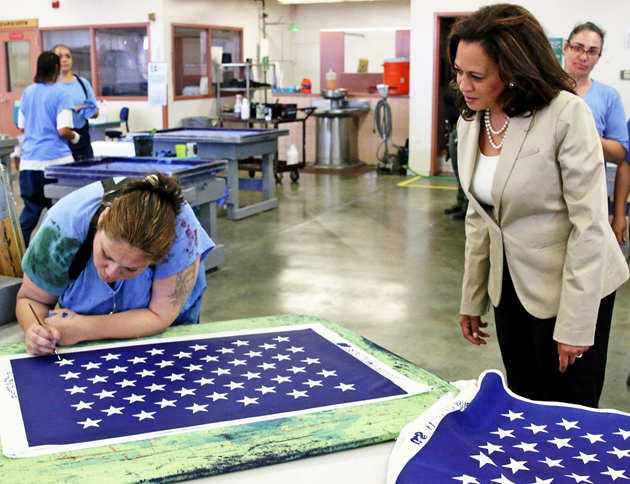 Sen. Kamala Harris visits a prison in California, where inmates manufacture American flags. Every generation or so, the American flag becomes a flashpoint in civic discourse. In recent memory, it’s been held aloft by civil rights marchers and burned by critics of the Vietnam War. It became a show of unity after 9/11 and, some would argue, a symbol of militarism as US intervention ramped up in the years after 2001. Today, it represents a country deeply divided along partisan lines, led by a man who disguises bigoted populism as patriotism. It’s also a symbol for a resurgent movement of white nationalists who cloak their hate in the stars and stripes, even as they defend Confederate monuments. And for countless others, it’s a symbol of a country that’s still a work in progress—work that they’re proud and humbled to do. The American flag is more than a symbol. It’s a product. But the American flag is more than a symbol. It’s a product. And for nearly a century, it’s been among the dozens of things made by incarcerated men and women inside America’s prisons. When we sing the Star Spangled Banner, we also think about those marching in the streets who demand that the ideals of that flag represent them too…And we think about women like the women I recently visited at a California state prison. They were making American flags. The kind you see waving over the United States Capitol or down the street at the Georgia state Capitol. Harris was referring to the visit she made to the Central California Women’s Facility in July, a visit on which I tagged along. It was a surreal experience to watch dozens of women, mostly women of color, at work stations inside of the country’s largest prison for women, laying out and printing fabric and then dyeing it royal blue. It was just as surreal, if not more so, to hear prison officials point out that these flags would one day fly atop every state and federal building in California, describing this with something almost adjacent to pride. I was born and raised in California and certainly took my fair share of California history classes from elementary school through college. In high school, I marched in protests against Proposition 21, the 2000 ballot initiative that made it easier to prosecute young people, and I was educated by the types of teachers who gave extra credit for attending demonstrations in downtown San Francisco against the Iraq War. But even I was surprised to learn that our country’s symbols of freedom were made by women who had none. They do this work for pennies on the dollar. When they’re released, their criminal records often disqualify them from finding work in the industries that shaped their lives on the inside. There are more than 2.2 million people incarcerated inside of America’s adult prisons, according to the Bureau of Justice Statistics. California’s prison population is notorious for its size—so much so that the Supreme Court ruled in 2011 that the overcrowded conditions were unconstitutional and ordered the state to reduce its inmate population by more than 30,000. At the time, California’s prison system was operating at nearly double the capacity it was originally built to house, and photos of rows of bunk beds lining gymnasiums spoke to the growing crisis. The surge in prison populations had largely happened in the 1980s and 1990s; as drugs flooded black neighborhoods, state legislatures adopted “tough on crime” policies and mandatory minimum sentences. For its part, California passed a “three strikes” law that put people away for life for relatively minor offenses. That sort of racial coding wasn’t atypical for the time. It was the norm. And the resurgent white nationalism among some Trump supporters proves that it still is. Trump played on white America’s deepest racial anxieties about inner-city crime during his campaign. Today, the federal and state agencies where racial disparities play out most prominently are America’s jails and prisons. Two-thirds of the women behind bars in America are women of color. They often are unemployed before being convicted and are struggling with addiction or mental illness, according to a report from the Vera Institute for Justice. Many of these prisoners make a wide range of products that we often take for granted in our daily lives: the mattresses we sleep on, the furniture in our college dorm rooms, the circuit boards that power our favorite gadgets. They make dentures for the elderly and even fight our most vicious wildfires. They do this work for literal pennies on the dollar. When and if they’re released, their criminal records often disqualify them from finding work in the industries that shaped their lives on the inside. I’d take that one step further. At its heart, the fights over the American flag are really battles over whose labor to “make America great again” we can and should recognize. It’s hard to reconcile that people without freedom are responsible for creating our symbols of it. But it’s a sign of what America has always been: a land in which freedom is only given to some.